Very rare And original UK Quad poster of Jaws. This classic image is timeless. The poster is in good condition with no major tears. It has been folded but stored rolled. It does have a price written in pencil in the top left corner but other than that its great! Theres no fading that I can see and no blue tack or pin holes. 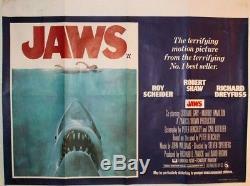 The item "JAWS Original UK Crown Quad movie Poster 1975 SPIELBERG Film UK Seller" is in sale since Friday, May 18, 2018. This item is in the category "DVDs, Films & TV\Film Memorabilia\Posters\Originals - UK Quads\1970s". The seller is "german_ww2_snapshots" and is located in HOUGHTON LE SPRING, Tyne and Wear. This item can be shipped worldwide.